East Bay Media is an American digital media company that specializes in streaming services for corporate events, educational institutions and sporting events. They wanted their website to be updated so that it was more current and offered a more streamlined description of their services. When we were planning this project we wanted to keep in mind that East Bay Media was already an established brand, we wanted to create a website that was reminiscent of this brand and had a certain amount of familiarity to it, our challenge was to simply modernize the service offerings and show them in a more clean and creative way. 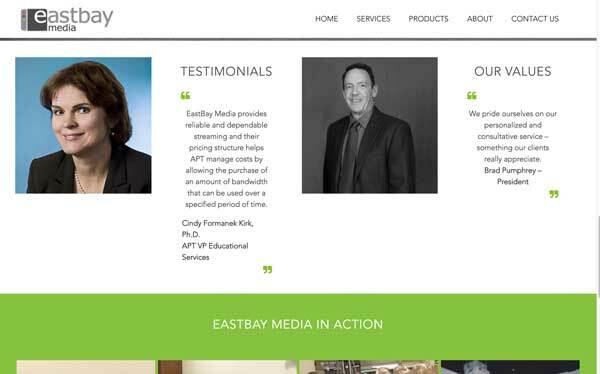 East Bay Media wanted us to really showcase the testimonials that they have achieved from their existing clients and present them in an interesting way. We chose to exhibit them in a rotating carousel that the client can easily update in the future with new feedback from their happy clients. This system was important to East Bay because the testimonials are a direct source of referrals and thus can be directly connected to new revenue. Having an easy-to-use system for managing and maintaining testimonials was crucial.